Coronary angiography using multidetector computed tomography (MDCT) allows non-invasive assessment of non-calcified, calcified and mixed plaques. Progression of coronary plaques may be influenced by statins. 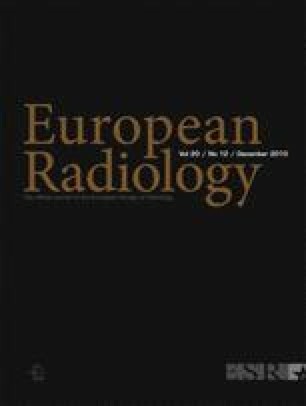 Sixty-three consecutive patients underwent MDCT as a follow-up to their original CT angiography in a retrospective longitudinal study. MDCT was performed by using a voxel size of 0.5 × 0.35 × 0.35 mm3 at two time points 25 ± 3 months apart. Non-calcified, calcified and mixed coronary plaque components were analysed by using volumetric measurement. The influence of statin, low-density lipoprotein (LDL) and risk factors was assessed by using a linear random intercept model for plaque growth. The volumes of non-calcified, calcified and mixed coronary plaques significantly (P < 0.001) increased from baseline (medians/interquartile ranges = 21/15–39, 7/3–20 and 36/16–69 mm3) to follow-up (29/17–44, 13/6–29 and 41/20–75 mm3). Statins significantly slowed the growth of non-calcified plaques (statin coefficient β = −0.0036, P = 0.01) but did not significantly affect the growth rate of mixed or calcified plaques. The effect of statin treatment on non-calcified plaques remained significant after adjusting for LDL levels and cardiac risk factors. Quantification using MDCT shows that progression of non-calcified coronary plaques may be slowed by statins. Dr Dewey has received grant support from GE Healthcare, Bracco, Guerbet, the European Funds for Regional Development (EFRE), the German Heart Foundation/German Foundation of Heart Research, and Toshiba Medical Systems and lecture fees from Toshiba Medical Systems, Guerbet, and Bayer-Schering. He is also a consultant for Guerbet. Dr Dewey offers hands-on courses on cardiac CT (www.ct.kurs.de). Dr Hamm has received grant support from GE Healthcare, Schering, Siemens Medical Solutions and Toshiba Medical Systems and lecture fees from Siemens Medical Solutions and Bayer-Schering. Furthermore, there are institutional research agreements with Philips Medical Systems, Siemens Medical Solutions and Toshiba Medical Systems. These funding sources had no role in the collection, analysis and interpretation of the data and in the decision to submit the manuscript for publication.